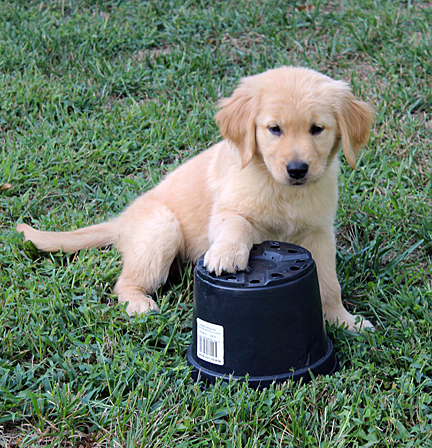 All sorts of new toys from friends and me....But her favorite was the empty plastic pot. I planted some mums in a decorative pot. Then Rosie dove on top of them and ran away with the plastic pot..
Rosie is a darling, but her house training is no where near reliable. This is a learning experience that takes most of my waking hours and a lot of the not so awake hours. My first goal is to introduce her to 100 new people this month. We are up to about 21, I think.